As I have mentioned before I love watching One Born Every Minute TV program and reading and hearing other people's pregnancy and birth story's. 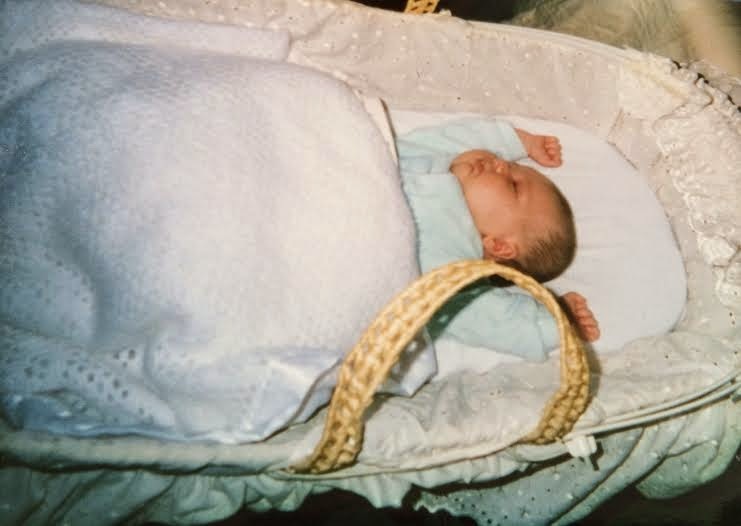 As I am more than halfway through my third pregnancy I have been looking back at my previous pregnancy's and I have decided to write about my first birth story with my oldest daughter Chloe all the way back in 2002. Even though Chloe was born almost 12 year's ago I still remember the day that she was born like it was yesterday. I was seven day's overdue and I had been to the hospital to see the consultant that day as my blood pressure was high and I was diagnosed as having pre- eclampsia as I had high blood pressure, protein in my urine, bad headaches and my hands and feet had swelled right up and a blood test at hospital had confirmed it. So it had been decided by the consultant that it was unsafe for me to carry on with my pregnancy and I needed to come into the hospital and be induced that day. I arrived at the hospital that night at 8.30 pm and I was shown to the induction room which was a 4 bedded bay in the delivery suite. I was examined and was found to be 3cm dilated which was a surprise as I had not even had the slightest twinge, I was told that as I was already dilated I would not need the pessary they use to induce labour. I was told to wait and see if labour started on its own that night and to try and get some sleep, I would be induced the following morning if I had not made any progress. Trying to sleep on a delivery ward was impossible I could hear women screaming all night, baby's crying and people coming and going, and I was feeling a bit nervous of all the women screaming thinking what had I let my self in for and that it was going to really hurt. At 7am after a night of no sleep, I was examined and told I was still only 3cm and I had not experienced any pains during the night and was feeling a bit disappointed that there was no sign of my baby making an appearance anytime soon. My waters were broken, I was dreading this but it did not all it just felt slightly uncomfortable. After my waters were broken I was told to walk around a bit to see if this would help bring on my labour, I started to get mild period type cramp's but when I was examined 4 hours later I was still only 3 cm dilated. So it was decided that I would be induced by drip to try to speed things up. I was taken to a delivery room and attached to monitors to keep an eye on baby's heartbeat due to being induced, I was hooked up to a drip. As soon as I was attached to the drip I started to get contractions and they were strong and powerful, nothing at all like period pains. I felt like my bump was getting squeezed in a vice, the contractions were coming one after the other with no break between them and they kept getting stronger and more powerful. I had gas and air to start with but it was not even hitting the pain so I was given diamorphine. The drugs, gas and air and the pain all mixed together made my labour pass by in a blur. I do remember begging for a epidural to take the pain away but the midwife kept putting me off, which looking back now I am glad she did. Then before I knew it I was getting told to push and after half an hour of pushing, had a baby girl which was a huge shock as I had been sure I was having a boy. Chloe Rose was born at 4.29 pm, 8 days late after a four and a half hour labour weighing 8lb 3oz and she was perfect and healthy. It really is true what people say as soon as your baby is born you forget all the pain and it is all worth it as you have a baby. I had to spend two nights in hospital as I was losing a lot of blood and Chloe was refusing to feed. Finally two days after she was born I was aloud to take my baby girl home and start my new life as a mummy.